5 stars - "Epson Stylus Office SX445 All-in-one InkJet Printer with CISS" by Jayden	, Written on 2012, 18:19/06/30 Very convenient to have scanner,printer and CISS as one set. 5 stars - "Epson Stylus Office SX445 All-in-one InkJet Printer with CISS" by Kael, Written on 2013, 16:58/02/15 This MFP is cool! Four colors certainly are not enough to print photos, but for text printing or printing of images it proves itself well. Buy Printer Epson Stylus Office SX445 with CISS and make 30 times more quality prints for the same money! Breakthrough in the world of printers! 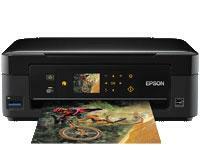 If you are a proud owner of a new model from Epson, you can print from any place of the world. And it is made in the following way: you send an email with the file you want to print out from your smartphone, tablet or laptop to the unique address of your printer. Cloud printing gives a lot of opportunities in the business world and in everyday life. The new device Epson Printer Stylus sx445 is designed specifically for home use. Its ultra compact size (40% smaller than any of the device from the previous series) allows you to place the printer even on the smallest desktop with comfort. This model also supports the opportunity to connect Wi-Fi automatically. This means that you do not have to mess with cables and connect the printer to your PC or laptop for printing or scanning. In addition, the ability of automatic connection provides additional comfort. You do not have to input the network settings for Wi-Fi manually any longer. To buy a new model Stylus sx445 Printer вЂ“ means to receive extremely high quality printing with maximum resolution of 5760x1440 dpi. High-speed printing (up to 33 pages in 60 seconds) allows you to cope with large tasks within the shortest possible time. The new printer is a four-color model with minimum drop size of 3 pl. Powerful flatbed scanner with a resolution of 1200x2400 dpi and the 1200x2400 dpi color copier may quickly perform any operation with documents and images. You may also become familiar with the models Epson Stylus Office sx440w and Epson Stylus Office b42wd. For multifunctional Epson Stylus SX425W it is better to buy pigment ink and paper with the density from 64 to 300 g/m2. If you want to print a lot and cheaply, without spending astronomical sums for printing documents and photos, we strongly recommend you to buy the system of CISS. Continuous Ink Supply System вЂ“ is a unique opportunity to print cheaper in 20-40 times. The proposed new product with CISS from Epson does not work worse than with the original cartridges, and incredibly low cost of prints and much larger volume of printing for one ink refill will make you happy. New multifunctional device from the Epson company вЂ“ is the best quality for a reasonable price. The new MFP from the Epson company вЂ“ is an ultra small model, the size of which is 40% less than that of the devices from the previous series. To buy the proposed model of the device вЂ“ is a great opportunity to print, make photocopies and scan wirelessly. You no longer have to find place for your MFP near the computer, to switch a PC every time you need to print something etc. вЂ“ this printer is a flexible freedom for users! Epson sx445 has compact size, but its functionality are the envy of even an experienced plotter. With the help of this multi-function device, you can print photos on matte, semi-glossy and glossy paper in the format of 10 x 15 cm, 13 to 18 cm and A4. Convenient LCD display with a diagonal of 6.3 inches and intuitive interface allow you to edit any image before printing easily. Print photos in black and white, cut any part of it, change the contrast, remove "red-eye" effect вЂ“ all that you can do with the represented printer without connecting PC. If you want to print with Epson stylus office sx445 all-in-one printer and at the same time to pay little вЂ“ order continuous ink supply system. CISS system supports multiple ink refilling. You do not need to buy a new cartridge every time, when the old one runs out of ink. Printing with CISS system will allow you to reduce the cost of each print in 20-40 times вЂ“ that is the economy estimated in thousands of percent. Very convenient to have scanner,printer and CISS as one set. This MFP is cool! Four colors certainly are not enough to print photos, but for text printing or printing of images it proves itself well.